8 Miami produced one of the craziest endings you will see all season on the final play against Duke. The Blue Devils took a 27-24 lead with six seconds left, but the Hurricanes had just enough time for one final kickoff return attempt. Corn Elder and the Canes delivered as they scored the game-winning touchdown on eight laterals. Miami had a 0.1 percent chance to beat Duke before the last play of the game, according to ESPN Stats and Info. Five different players were involved in the play but Elder finished it off with the 91-yard return. There has been much controversy surrounding the question if a Miami player's knee was down on the last play. Whether it should have counted or not, Miami's eight laterals will not be forgotten anytime soon. 3 Three Big Ten teams remain undefeated with defending champion Ohio State, Michigan State and Iowa all posting 8-0 records through the first nine weeks of the season. The conference hasn't had that many teams with a 8-0 record since 1903 when Chicago, Minnesota and Northwestern posted those numbers. The Hawkeyes' start is their best since they won their first nine games back in 2009. For the Spartans, this is the first 8-0 start since 2010. The Buckeyes meanwhile continue to have the longest active winning streak in FBS and have a chance to tie the longest conference winning streak mark in Week 10. 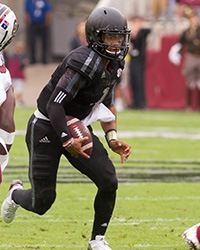 20 Texas A&M quarterback Kyler Murray earned his first career start and he did not disappoint for the Aggies. Murray became just the second SEC player in the last 20 years with 100 yards, a passing touchdown and rushing touchdown in his debut, joining former Auburn quarterback Cam Newton in that category. The true freshman was also the first freshman A&M quarterback to rush for over 100 yards in his first start. Murray finished the day with 223 passing yards, 156 rushing yards and a pair of touchdowns in the Aggies' 35-28 win over South Carolina. 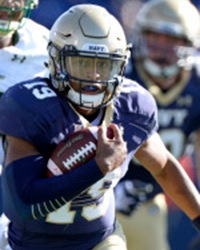 77 Navy quarterback Keenan Reynolds tied the mark for most career rushing touchdowns in the Midshipmen's win against South Florida on Saturday. Reynolds rushed for his 77th touchdown, which tied the record held by Wisconsin running back Montee Ball from 2009-2012. The quarterback tied the mark in the fourth quarterback thanks to a pair of 1-yard touchdown runs, including the go-ahead touchdown with seven minutes to play. Reynolds finished with 117 rushing yards on the afternoon. 123 Oklahoma State and Texas Tech combined for 123 points, the highest total for FBS game in 2015 and the fourth largest in the last 10 seasons. The Cowboys' 70 points set a school record for most points in a conference game. The Red Raiders' Jakeem Grant recorded 323 all-purpose yards, including a 90 yard reception and 100-yard kickoff return, and now ranks fourth all-time in that category in a single-game. Both teams had a total of 61 first downs and over 1,304 yards during the game. 2,000 The Rebels' Laquon Treadwell is one of the most dynamic wide receivers in the country and he joined elite company in his team's win over Auburn. Treadwell surpassed the 2,000 career receiving yards mark on Saturday, becoming only the seventh Ole Miss player in program history, but he did so in the fewest amount of games (31). Against the Tigers, the wide receiver caught seven passes for 114 yards and one touchdown. It was also the fifth straight game Treadwell had over 100 yards receiving, tying the single-season school record. 0 Georgia has zero rushing touchdowns in three straight games with absence of Nick Chubb ... Houston held Vanderbilt to zero points, the first shutout by the Cougars against SEC team since 1969. ... 3 Navy had three 100-yard rushers in a game for first time in program history. ... Oregon converted the same number of fourth downs as it did third downs with three of each during its OT win over Arizona State. ... 6 Nebraska lost six games before the end of October for the first time in program history. ... 11 Florida QB Treon Harris has completed only 11 passes against Georgia in the past two years. ... 12 Stanford trailed Washington State by 12 at halftime, which was the second biggest comeback for the Cardinal in past 10 seasons. ... 15 Gunner Kiel completed all 15 of his pass atempts and added five touchdown in Cincinatti's win. ... 115 Colorado tied the FBS record for most plays in a game with 115, only the fourth team to accomplish that. ... 476 Marshall QB Chase Litton finished with 476 passing yards against Charlotte for the second-most yards in a non-bowl game for the Herd. ... 496 Air Force combined for 496 rushing yards against Hawaii, the second straight game with at least 400 yards rushing. ... 10,000 TCU quarterback Trevone Boykin topped the 10,000 mark in passing yards in the win over West Virginia. He trails Andy Dalton by 234 yards in the all-time passing list.